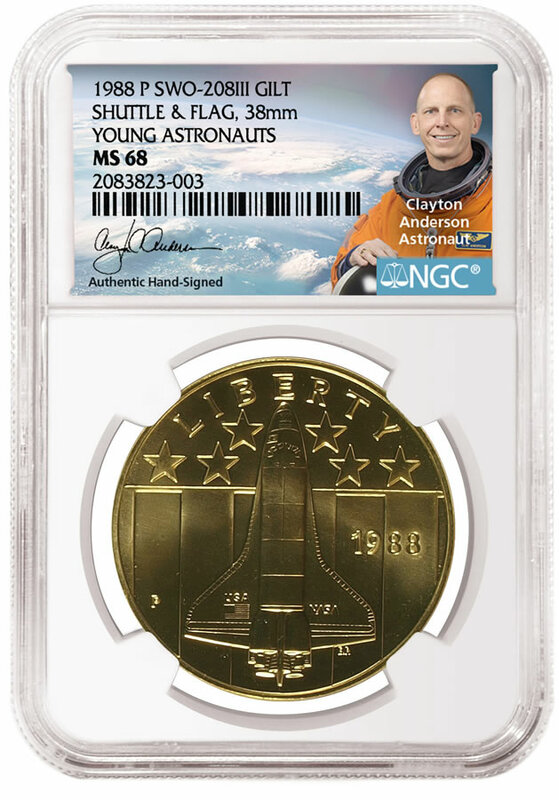 Numismatic Guaranty Corporation (NGC) has announced that American astronaut Clayton Anderson will individually autograph NGC certification labels. From 2007 to 2010, Anderson was a part of three Space Shuttle missions and two consecutive International Space Station expeditions. "We are honored to have Clayton Anderson help take the NGC Signature Label program to new heights," says Miles Standish, an NGC vice president. "His inspiring story is one that anyone who has worked hard for their dreams can connect with." Anderson first rocketed to space aboard Space Shuttle Atlantis (STS-117) on June 8, 2007, and he stayed for five months, with most of his time spent aboard the International Space Center as part of Expeditions 15 and 16. He took part in a nearly 8-hour spacewalk, called an EVA (extravehicular activity), on July 23 with a Russian crewmate. He returned to Earth with Space Shuttle Discovery (STS-120) on November 7, 2007. Anderson returned to space on Discovery as part of STS-131, a 15-day mission in April 2010. NASA’s Shuttle era ended the following year; Discovery is now in the Smithsonian Institution’s National Air and Space Museum at a facility in Chantilly, Virginia, while Atlantis is on display at the Kennedy Space Center Visitor Complex at Cape Canaveral, Florida, not far from where Anderson launched and landed aboard the shuttles. Anderson was born in Nebraska and graduated from Iowa State University with a master’s degree in aerospace engineering. Determined to be an astronaut, Anderson applied 15 times before finally being accepted by NASA in 1998. Anderson is the only Nebraskan to have flown in space, with 167 days total and six spacewalks. Now 59 and retired from NASA, he is the author of "The Ordinary Spaceman: From Boyhood Dreams to Astronaut," "A is for Astronaut" and "It’s a Question of Space!" "It was an incredible honor and a thrill to have been selected to spend 167 days living and working in outer space," Anderson said. "It is a pleasure to now work with NGC to autograph labels that appeal to space enthusiasts and numismatists alike." 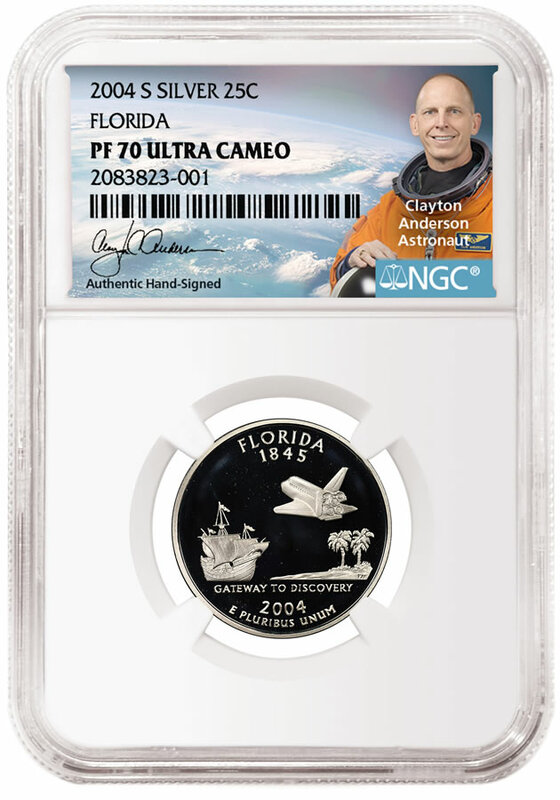 NGC Clayton Anderson Authentic Hand-Signed Labels are the perfect complement to any space- or Americana-themed numismatic item, including the 1971-1978 Eisenhower Dollar series (whose reverse shows an eagle landing on the moon to celebrate America’s achievements in space), the 2004 Florida State Quarter (whose reverse shows NASA’s Space Shuttle), the 1988-P Young Astronauts Shuttle and Flag Medal, and American Silver, Gold and Platinum Eagles. 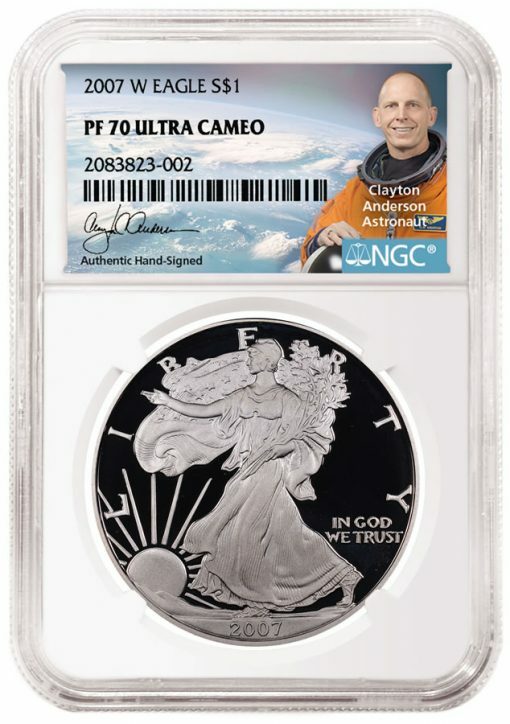 Anderson joins NGC’s already-impressive list of label signers, including fellow astronaut Charlie Duke; Kenneth Bressett, the editor emeritus of A Guide Book of United States Coins (the "Red Book"); and John M. Mercanti, the 12th Chief Engraver of the US Mint and designer of the American Silver Eagle reverse. NGC Clayton Anderson Authentic Hand-Signed Labels will be available from select retailers later this year. For more information about NGC Authentic Hand-Signed Labels, visit NGCcoin.com/Labels. Here we go. Buy the label, not the coin, Right?